both are cut to shape but the design of the 1/- is not touched and the 10d design is almost totally intact. Both stamps are neatly tied by the 38 duplex with indented corners. 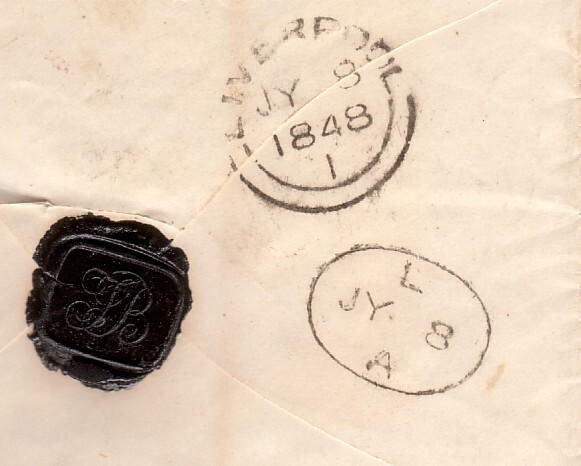 the EKD for the indented corners variety as August 19th 1853: the example offered here is 16 days earlier than this. Parmenter notes that only approx 10% of mail cancelled by this type of 38 duplex went overseas. 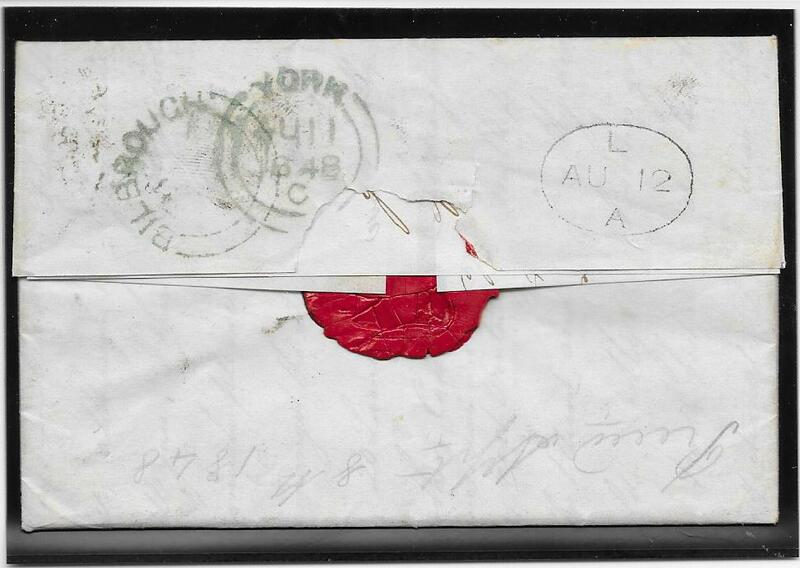 The item offered here is believed to be the earliest known usage of this duplex on mail to an overseas location. suggests that the indented corners variety was used after the end of the squared corners variety. This example clearly shows that both types of duplex were in use at the same time at least for some period. The 10d has been affected by a light vertical filing crease. A very attractive and very rare usage which would make a fine Exhibition item. NB: these 38 duplex types have been considered as possibly used on Late Fee mail. However in this example, and in 152168, there is no indication that a late fee has been paid. This item and the next one,152168, would make a remarkable and unique Exhibition pairing. 152168. 1d red 'TA', 2 plus margins, on a Medical Insurance Annual Statement, from London to the ISLE OF WIGHT. 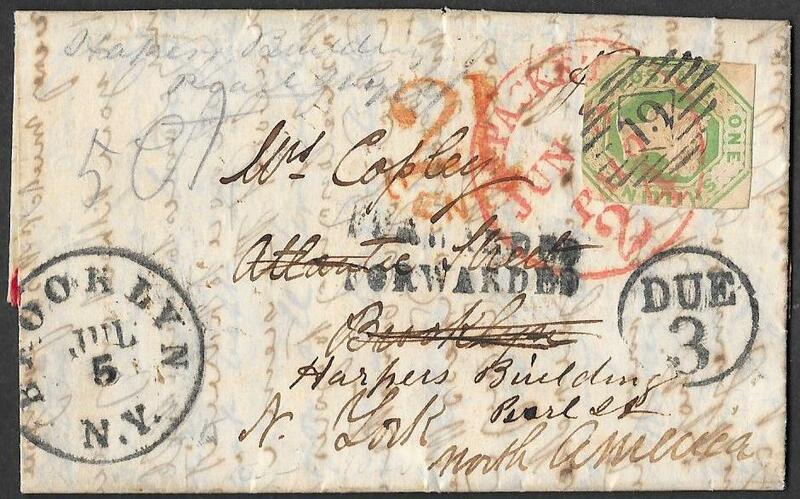 On the front is a partial strike, but legible, of the udc from GODSHILL, Isle of Wight, County Cat. IW51: this is recorded in magenta (1841) and black (1846-47). The strike here is in BLUE, unrecorded as such and used some 6 years later than previously recorded in black: it may be an isolated usage of an old canceller. 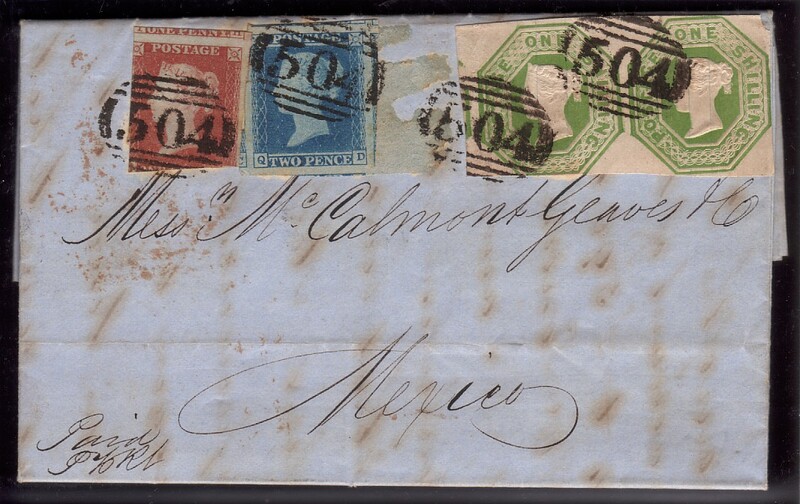 The stamp is tied by a double strike, barely overlapping, of the duplex 38 with indented corners for August 9th 1853: Contrary to PO Regulations. 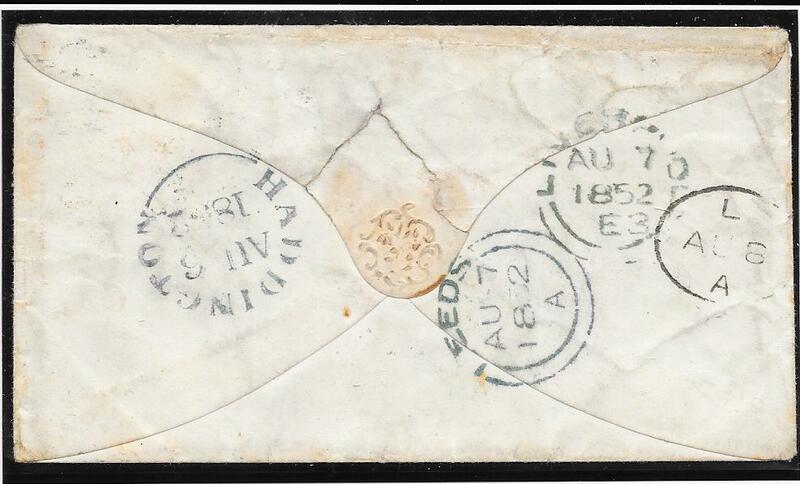 the EKD for the indented corners variety as August 19th 1853: the example offered here is 10 days earlier than this. after the variety without indented corners ended on August 8th 1853; however, see the previous item 152169.
just into along the top, with two unusually large margins. Cancelled by a variant of the LIVERPOOL '466' numeral. The Die 2 at the base of QV' head is visible under the cancellation. The scarcer Die 2 is priced by Gibbons at £1,100. An attractive and very scarce example. 151895. 6d SG60, three large to huge margins, into at the base of the fourth. Tied to a printed insurance entire from London to Huddersfield. on the top flap which displays well when the flap is raised. on March 10th 1854, is the earliest usage we have seen. SG60 priced by Gibbons at £1,900 on cover. A rare early date of usage. NB: the entire is in a cleaner condition than the scan suggests. a brother and an aunt of the addressee, June 19th 1855 London cds on reverse. 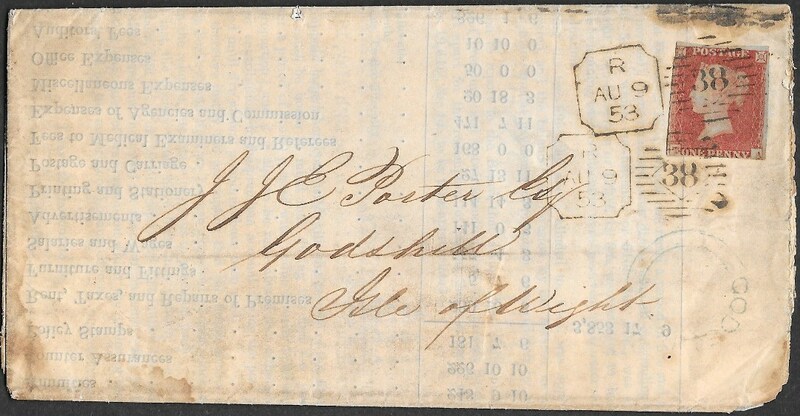 Exchange Office date stamp with the '21 cents' credit for the American Packet adjacent. 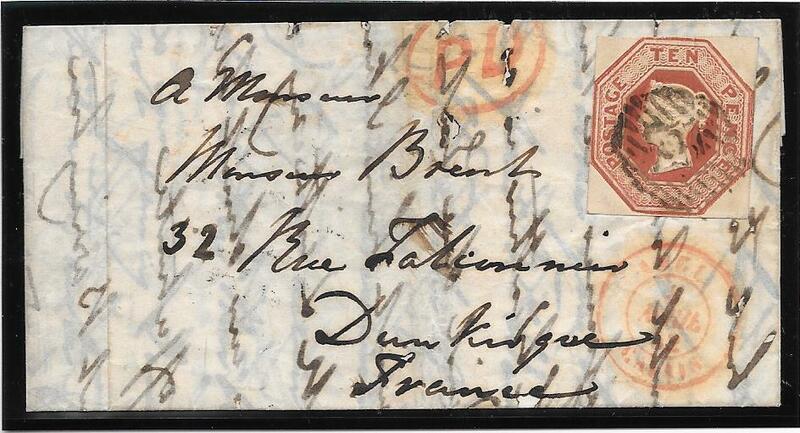 Forwarded handstamp to Brooklyn, New york with the Brooklyn date stamp and a handstruck 'Due 3'. At the top left is in pencil 'Harper Building' and due '5ct' indicating an additional carrier fee. 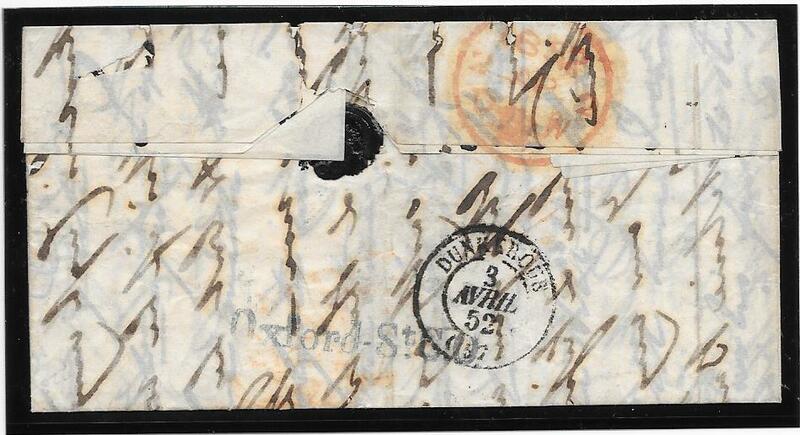 An attractive re-addressed item with an interesting variety of transit markings. but rebuilt on the original site facing Franklin Square. A fine line engraved drawing of the new building is available on the iternet. 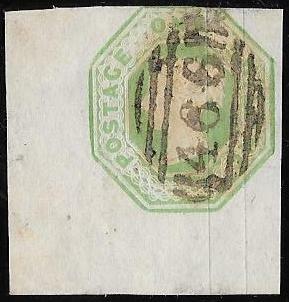 10d SG57 on small entire to France. on entire to Dunkirque from London, April 1852. Rarely is this 10d found on such a small neat entire. Gibbons prices it on cover at £3,200. 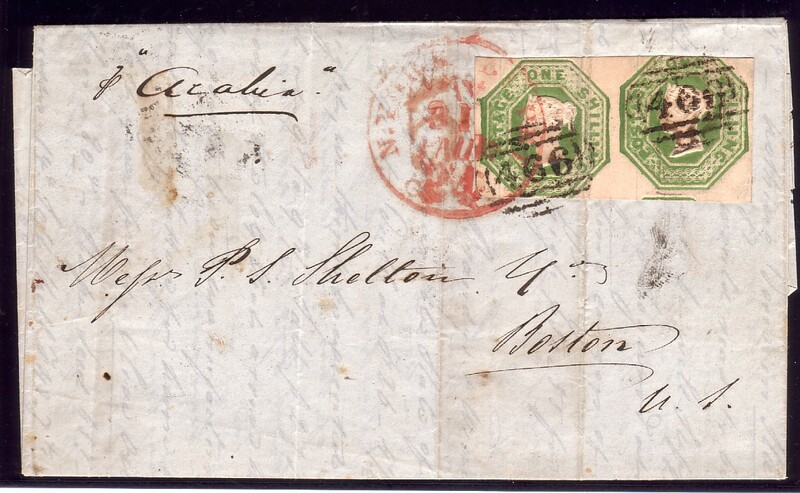 from HADDINGTON to New York, Haddington cds on reverse for August 6th 1852. 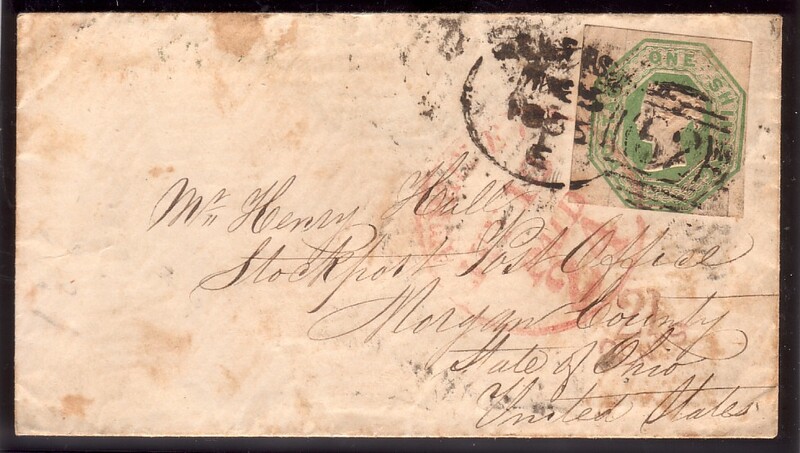 Received in Liverpool on Sunday August 8th 1852.
the next one going to New York would have been chosen. arriving in New York on August 22nd 1852. Items of mail carried by the Collins LIne are less frequently found than those carried by the Cunard LIne. 1/- SG55 priced by Gibbons at £1,900 on cover. NB: item is in cleaner condition than the scan suggests. on commercial entire to Boston, USA. Very fine embossing and in a rich shade of the scarcer deep green. which for a fee of one shilling, late letters were accepted to be carried on the ship soon to sail. 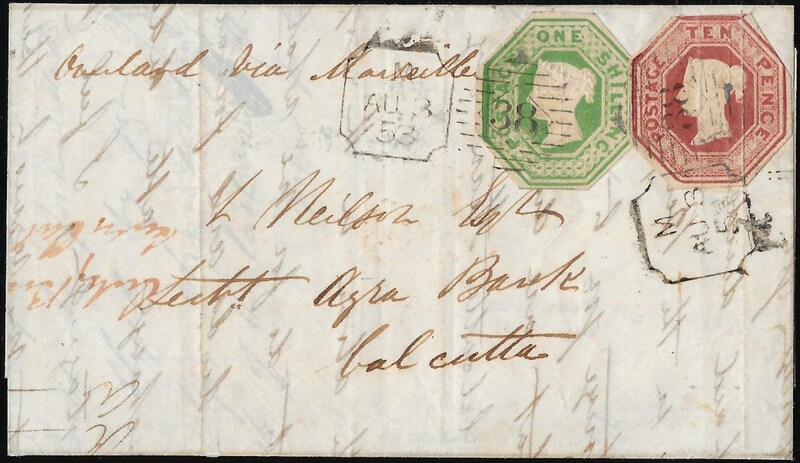 Top left is in m/s ‘Arabia’ which left Liverpool for Boston on May 21st 1853.
on which this letter was carried was only its 4th sailing out of a total of 70 Atlantic crossing up to September 4th 1864. Single SG56 on cover priced by Gibbons in excess of £2,000. 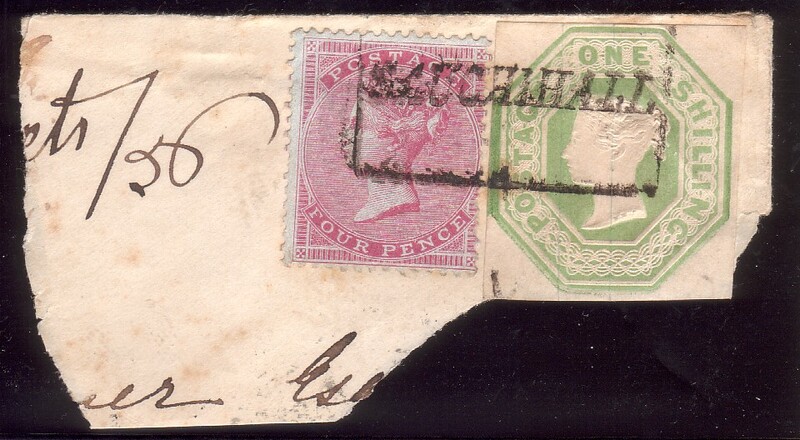 with parts of four other stamps, but small defect at left and tied by very fine ’503’ strikes of Mansfield. and London transit date stamp for the following day. The rear flap when raised displays the Sunday date to advantage. A single one shilling priced by Gibbons on cover at £1,900. 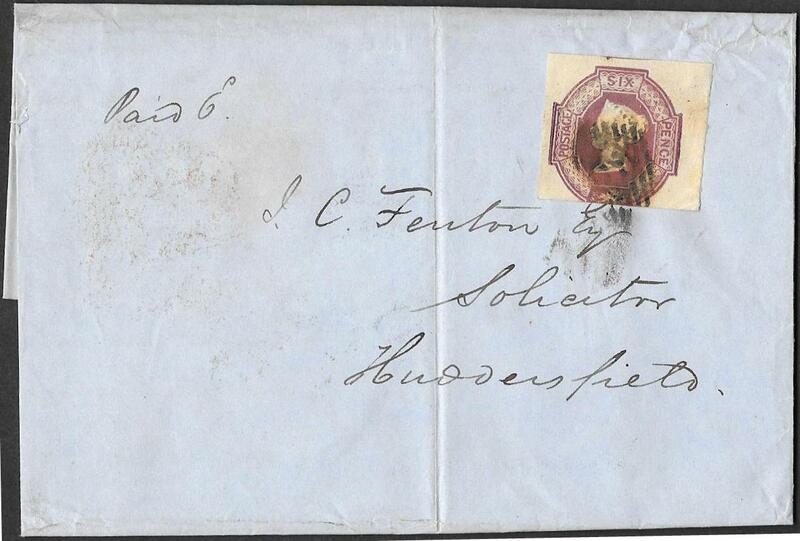 A rare item made rarer by the Sunday usage – the first we have seen for this stamp. 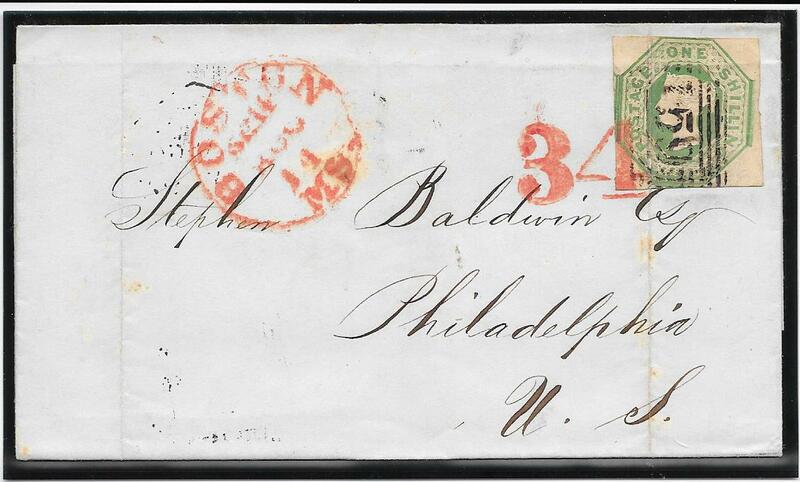 The next series of FOUR items is from the RETALIATORY RATE PERIOD of postal conflict between Britain and the US. Each item was carried on a different Cunard Ship and would make a very fine Display. 15003. 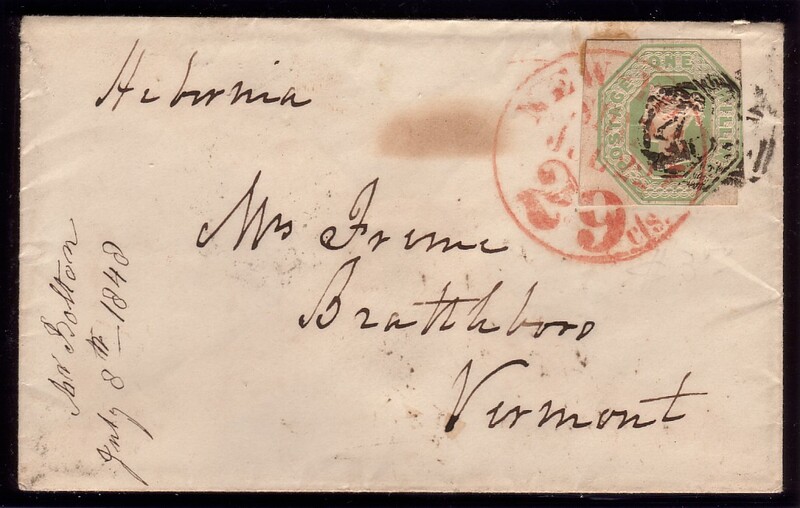 1/- SG55, almost full margins, on envelope to Vermont, USA from Liverpool. on delivery for up to 300 miles radius of New York. between GB and the US postal authorities. SG55 priced by Gibbons on cover at £1,900. 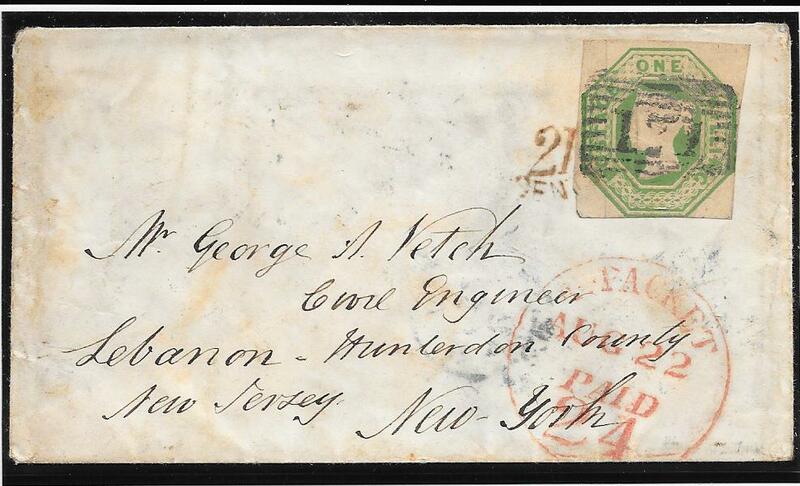 crossed by a bend and filing crease, on a very clean wrapper from Glasgow to Philadelphia. 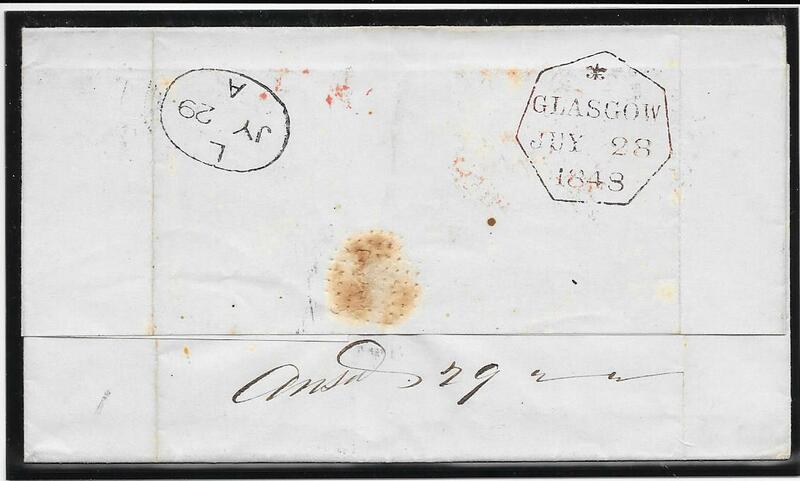 Glasgow heptagonal date stamp for July 28th 1848 - unusual abbreviation for July, 'JUY' and not 'JUL'. 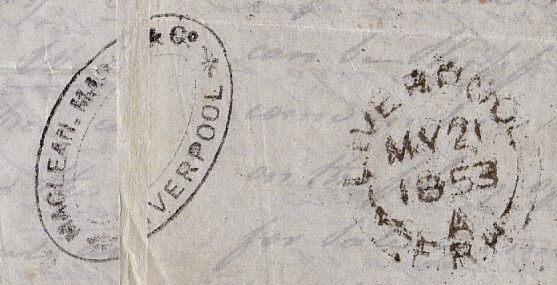 Liverpool maritime receiving date stamp for July 29th 1848.
leaving Liverpool on July 28th 1848, and arriving in Boston/NY on August 13th. as a consequence of the postal 'war' between Britain and the USA. the 6th out of a total of 25 sailings during this time of tension. this period of postal conflict between the two countries. SG55 priced by Gibbons at £1,900 on cover. 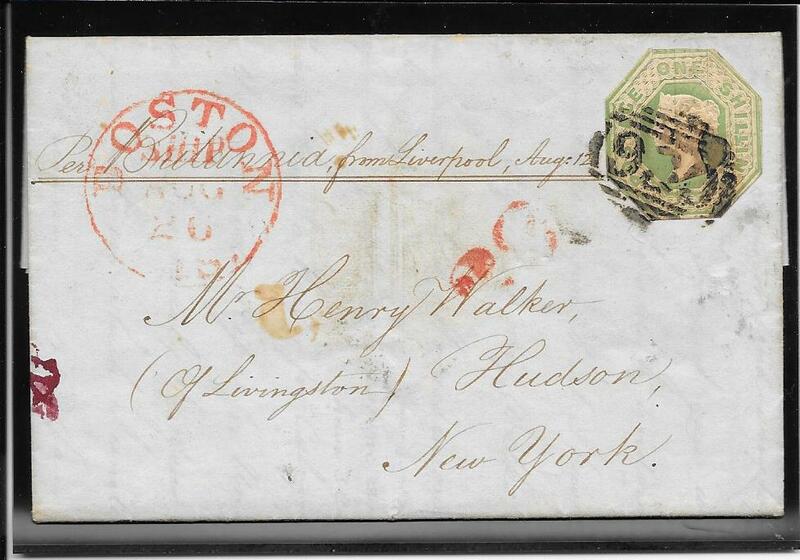 on a well written interesting family letter from a very small village, BILBOROUGH, to Hudson, New York dated inside August 11th 1848. 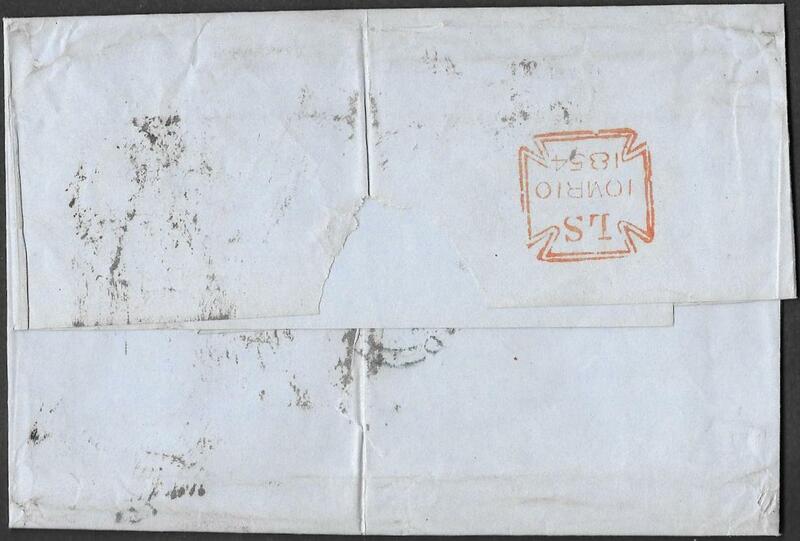 Bilborough UDC on the reverse top flap - unrecorded in the Yorkshire County Catalogue. The letter is from one farming family to another and refers to the sales of butter, wheat and beef. Reference is made to the Tax on Corn and how next year (1849) with the commencement of FREE TRADE things should improve. The Corn Law and the Navigation Act were repealed when the Free Trade Act came into force: more information on the Internet. sailing to the US on August 12th arriving in Boston/NY on August 26th 1848.
the RETALIATORY RATE PERIOD. This was the FIRST sailing of 'Britannia' in this period of conflict. 15004. 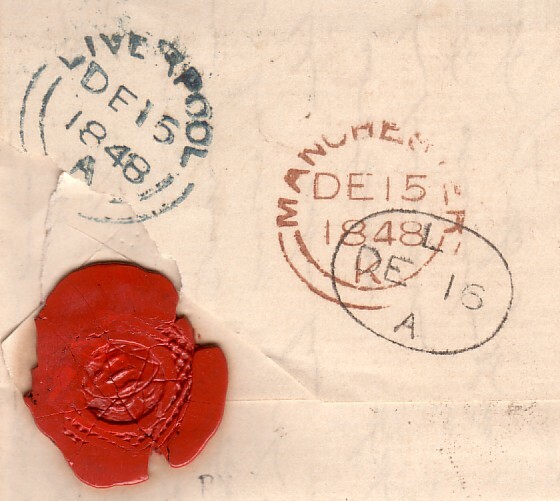 1/- SG55, cut to shape on a letter from Upper Mill, Yorkshire to a Post Office in New York. Very fine Upper Mill udc in red on the front, County Catalogue YK3008, tied by Manchester 498. Clear indication on the front in m/s of the letter to be carried on Cunard’s ‘Europa’. 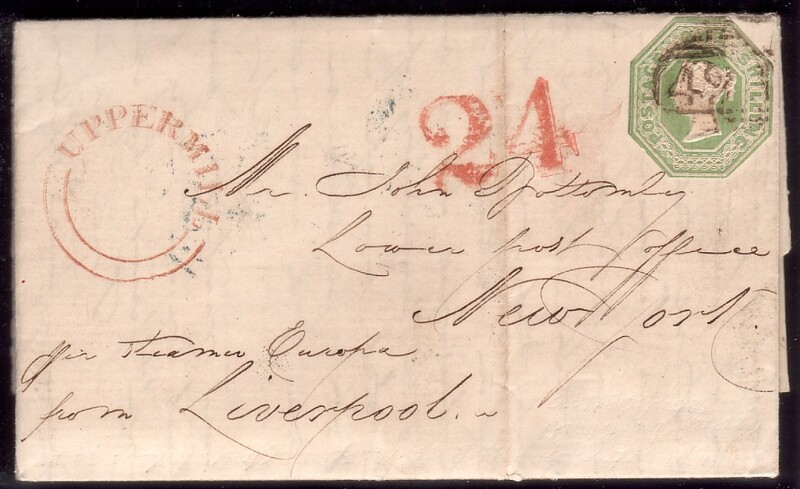 On the reverse - see scan – Liverpool shipping date stamp for December 16th 1848. Europa sailed on that day for New York. This was the LAST SAILING during the RETALIATORY RATE PERIOD. the very last time such a rate was applied as the conflict between GB and the US postal authorities came to an end. Irish Spoon on 1/- SG55. tied by a dirt - filled English type Belfast spoon type b, May 1855. Unrecorded usage by Arundel on the shilling embossed issue. Very difficult to find Irish spoons on cover with any of the embossed stamps. Priced by Gibbons at a minimum of £1,900.